Nouri Kamil Mohammed Hasan al-Maliki, also known as Jawad al-Maliki or Abu Esraa, is an Iraqi politician who was Prime Minister of Iraq from 2006 to 2014. He is secretary-general of the Islamic Dawa Party and a Vice President of Iraq. 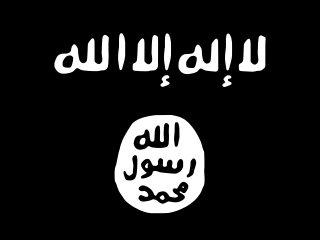 The Islamic State of Iraq was a militant Salafist jihadist group that aimed to establish an Islamic state in Sunni, Arab-majority areas of Iraq during the Iraq War and later in Syria during the Syrian Civil War. Baghdad International Airport, previously Saddam International Airport, is Iraq's largest international airport, located in a suburb about 16 km (9.9 mi) west of downtown Baghdad in the Baghdad Governorate. It is the home base for Iraq's national airline, Iraqi Airways. Karrada is an upper middle class district of the city of Baghdad, Iraq. It has a mixed population with a Shia majority and a significant Christian minority. It is one of the most religiously diverse areas of the city, and is one of the two major districts of the Christian community in Baghdad, along with Dora. All of the Christians of the district congregate in Inner Karrada, where most of the Churches are located, with congregations of Chaldeans, Assyrians, Melkite Greeks, and Armenian Catholics. It has two sub-districts, being Nazaith and Masbah. Karrada is on the northern part of the peninsula, which was created by a sharp turn in the Tigris river. As a result, the district ended up boasting lots of waterfront property, which helped turn the area into the expensive district it is today. Tikrit sometimes transliterated as Takrit or Tekrit, is a city in Iraq, located 140 kilometres (87 mi) northwest of Baghdad and 220 kilometres (140 mi) southeast of Mosul on the Tigris River. It is the administrative center of the Saladin Governorate. As of 2012, it had a population of 160,000. Events in the year 2005 in Iraq. The 2008 al-Qaeda offensive in Iraq was a month-long offensive conducted by al-Qaeda in Iraq against the multinational coalition of USA, UK, Australia and Poland. The year was most notably marked by a series of battles in Fallujah. See Fallujah during the Iraq War. 2006 in Iraq marked the onset of sectarian war, making it the deadliest year of the war. This article details major terrorist incidents in Iraq in 2008. In 2008, there were 257 suicide bombings in Iraq. On February 1, a pair of bombs detonated were at a market in Baghdad, killing 99 people and injuring 200. Two other particularly deadly attacks occurred on March 6, and June 17. This article details major terrorist incidents in Iraq in 2009. In 2009, there were 257 suicide bombings in Iraq. On April 23, a suicide bombing to a restaurant in Miqdadiyah killed 57 people, while a separate bombing in southeastern Baghdad killed 28. The next day, on April 24, a Shi'a shrine was targeted, in a bombing that killed 60. October and December saw two attacks kill over 100 people, with bombings on October 25 and December 8. The 13 June 2012 Iraq attacks were a series of simultaneous bombings and shootings that killed 93 people and wounded over 300 others. The attacks were carried out in seven different locations throughout Iraq. The 9 September 2012 Iraq attacks were a series of coordinated bombings and shootings across the capital Baghdad and several major cities in the north and south of the country. At least 108 people were killed and 371 injured in the first major insurgent action since a similar wave of violence almost a month earlier. The 19 March 2013 Iraq attacks were a series of coordinated bombings and shootings across the capital Baghdad and several major cities in the north and central parts of the country. At least 98 people were killed and more than 240 others injured in the wave of violence, which took place on the tenth anniversary of the beginning of the Iraq War. The 2013 Hawija clashes relate to a series of violent attacks within Iraq, as part of the 2012–13 Iraqi protests and Iraqi insurgency post-U.S. withdrawal. On 23 April, an army raid against a protest encampment in the city of Hawija, west of Kirkuk, led to dozens of civilian deaths and the involvement of several insurgent groups in organized action against the government, leading to fears of a return to a wide-scale Sunni-Shia conflict within the country. By 27 April, more than 300 people were reported killed and scores more injured in one of the worst outbreaks of violence since the U.S. withdrawal in December 2011. From 15 to 21 May 2013, a series of deadly bombings and shootings struck the central and northern parts of Iraq, with a few incidents occurring in towns in the south and far west as well. The attacks killed at least 449 people and left 732 others injured in one of the deadliest outbreaks of violence in years. On 27 May 2013, a series of coordinated attacks occurred in Baghdad, the capital of Iraq, killing 71 people and injuring more than 200 others. On 10 June 2013, a series of coordinated bombings and shootings struck the central and northern parts of Iraq, killing at least 94 people and injuring 289 others. On 16 June 2013, a series of coordinated bombings and shootings struck across several cities in Iraq, killing at least 54 people and injuring more than 170 others. During the first two weeks of July 2013, a series of coordinated bombings and shootings struck across several cities in Iraq, killing at least 389 people and injuring more than 800 others. On 4 December 2013, a series of coordinated attacks took place in central and northern Iraq, with the biggest assault taking place at a government building and an adjacent shopping mall in Kirkuk. More than 30 people were killed in the attacks that day, while at least 106 were injured. The following lists events the happened in 2013 in Iraq. This is a timeline of events during the Iraqi Civil War in 2017. 1 2 3 4 5 6 7 8 9 10 11 12 13 14 15 16 17 18 19 20 21 22 23 24 25 "Iraq's Bloody Monday: 75 Killed, 356 Wounded". Antiwar.com. 16 April 2013. Retrieved 16 April 2013. 1 2 3 "Car Bombs Kill 5 in Iraq". Voice of America. 16 April 2013. Retrieved 16 April 2013. 1 2 3 4 5 6 7 8 "Iraq deadly bombings hit Nasariyah, Kirkuk and Baghdad". BBC. 15 April 2013. Retrieved 16 April 2013. 1 2 Raheem, Kareem (15 April 2013). "Bombs kill more than 30 across Iraq before local poll". Reuters. Retrieved 16 April 2013. 1 2 3 4 5 "Many dead in serial blasts in Iraq – Middle East". Al Jazeera English. 15 April 2013. Retrieved 16 April 2013. 1 2 3 4 "Iraq bombings kill six". AFP. 16 April 2013. Retrieved 16 April 2013. ↑ "Nationwide bomb attacks rattle Iraq ahead of polls". Deutsche Welle. 15 April 2013. Retrieved 16 April 2013. ↑ Tawfeeq, Mohammed (16 April 2013). "Deadly wave of bombings across Iraq ahead of elections". CNN. Retrieved 16 April 2013. ↑ "Police: arrest the perpetrators of yesterday's Kirkuk bombings". National Iraq News Agency (NINA). 17 April 2013. Archived from the original on 30 June 2013. Retrieved 16 April 2013. ↑ "Eight suspects in yesterday's bombings arrested in Diyala". National Iraq News Agency (NINA). 17 April 2013. Archived from the original on 30 June 2013. Retrieved 16 April 2013. ↑ "Sadr: Explosions take place while the ruling party busy campaigning for election". National Iraq News Agency (NINA). 17 April 2013. Archived from the original on 30 June 2013. Retrieved 16 April 2013. ↑ "Ashton condemns attacks in Iraqi cities". KUNA. 16 April 2013. Retrieved 17 April 2013. ↑ "France condemns new wave of bombings in Iraq". KUNA. 16 April 2013. Retrieved 17 April 2013. 1 2 "Iran condemns deadly car bombings in Iraq". Press TV. 16 April 2013. Retrieved 16 April 2013. ↑ "Japan condemns bomb attacks in Iraq". KUNA. 16 April 2013. Retrieved 17 April 2013. ↑ "Berri phones al-Maliki to express condemnation of Yesterday bombings in Baghdad and several other provinces". National Iraqi News Agency (NINA). 16 April 2013. Archived from the original on 30 June 2013. Retrieved 17 April 2013. ↑ "Number of casualties rises to 21 in Baghdad bomb attacks". Anadolu Agency. 15 April 2013. Retrieved 16 April 2013.